In case nobody has told you, voice search is taking over! In fact, it is predicted that 50% of all online searches will be done using a voice assistant like Alexa, by next year. When you consider the fact that nearly 100% of all real estate transactions begin with internet search, it becomes clear that you can’t afford to not have a presence on audio platforms. That means that all of you that have been desperately working on SEO for Google are about to have your heads spin. It also means that you will have your own real estate Alexa Skill so that you can make bank off of the audio revolution we are experiencing. Odds are, if you have an Alexa Skill for your real estate business, then you already have a real estate podcast that you are using to feed the audio content. Your podcast is an obvious place for you to let people know that you are now available for audio consumption on their Amazon Echo Devices. Make sure that you let them know what value they can expect from the skill and why their lives will become easier for adding your skill to their Alexa device. Podcast tours are one of the fastest, easiest, most inexpensive (usually free) ways to promote just about any product or service these days. However, because most people don’t even realize that podcast tours are even a thing, so it is a method that is still under-utilized. I predict that in time, podcast tours will become a more monetized method of marketing which will increase the costs, so get in while the getting is good and free. I suggest you, or your assistant, line up a series of interviews on podcasts that share a similar audience or one that you hope to attract to your new skill. You can simplify the scheduling portion of podcast interviews with 10to8 which I use for booking all of my consultations and interviews. 10to8 has made the entire process of getting booked a breeze. Make sure that you are always a gracious guest and that you go out of your way to give the audience value without over-selling. Save your Alexa skill plug for the very end when you are asked how people can learn more about you or stay in touch. If you are advanced enough to see the value in voice and create your own real estate Alexa Skill, it is probably safe to bet that you understand the importance of branding your social media platforms. One standard way in which this is done on Facebook, LinkedIn, Twitter, and beyond is with your profile’s cover image. I suggest that you have a member of your team of a freelancer from Fivver design a new set of cover images that prominently feature your new Alexa Skill. I suggest that you have your designer craft an image that is on-brand but different enough from your last one so that it stands out. For Facebook, you may even want to use a service like Promo which will allow you to create a background video for your page. Below is an example of a video that I created with Promo and have used for my Facebook page, Best Real Estate Writer. You may even want to do a quick live video on each platform explaining the drastic changes to your page and letting everyone know about the exciting new addition to your business. One of my favorite ways to stay in touch with my tribe and keep them in-the-know about everything that is going on in the real estate industry, new content I have produced just for them, and new products that I am unrolling. There have been a lot of dirty little rumors floating around that email marketing is dead. Not true my friends. Granted, things have changed, but email is still very much alive. An email blast is a great way to let people know about this new, high-tech, more convenient option that you have made available to them for consuming the content that they crave. Explain to them in the body of your email why you created the skill, who the skill is for, and how the skill will improve their days or lives. If you don’t already have an email marketing account, I recommend both MailChimp and Aweber. MailChimp is better if you are newer to email marketing but Aweber has more features and capabilities that are powerful for moving people through your sales funnel. Use this link to get discounted rates on email marketing from Aweber. Additionally, it is a good idea to include a link to your Alexa Skill right in your email signature. It is not uncommon to include links to your social media or mobile app, so why not include your fancy new Alexa Skill? One of the factors that help people to determine if they want anything is through social proof. As humans, we don’t want to buy into anything that isn’t as great as it claims to be. Not only do we hate to waste money, but it hurts our precious ego when we buy something that doesn’t work the way that we had hoped. That’s why social proof is so important. The question is, how do you get social proof for your brand new real estate Alexa Skill? You hack the system. Well, sort of. I suggest that you offer some type of free gift or giveaway in exchange for adding, rating and reviewing your skill. Just be careful about who you offer it to. You want to make sure that you are only offering it to people that will be interested in the skill and aren’t just in it for the freebie. Influencer marketing is one of the most under-utilized, and smartest strategies in the real estate industry. I highly recommend that you start getting comfortable with influencer marketing right now if you haven’t already. In terms of getting your skill out there, you need to target strategic people on Instagram, YouTube, and SnapChat to start plugging it and talking about how great it is. You would be surprised by how many influencers out there are willing to plug you, your service, your skill, whatever, for very little money or for a trade of some sort. If budget is a concern, take the time to learn about the influencer and what motivates them to see if you have something to offer that would be of value to them, other than cash. But don’t expect to get something for free. Remember, anything worth having is usually worth paying or working for. Anytime that you are trying to promote something, like your new course for first-time homebuyers, your new real estate book, or your new Alexa Skill, you should create blog articles surrounding the related topics with a CTA included that drive traffic to your new product. Blog articles, podcast episodes, and vlogs are a fantastic way to get people interested and excited about your new release because they allow you to explain its value. Want Your Own Real Estate Alexa Skill? If you are tired of playing catch-up and want to be the first real estate pro in your local market with a winning Alexa Skill, I can help you. I will handle all of the complex tech stuff, walk you through your role, and manage your skill for you too! 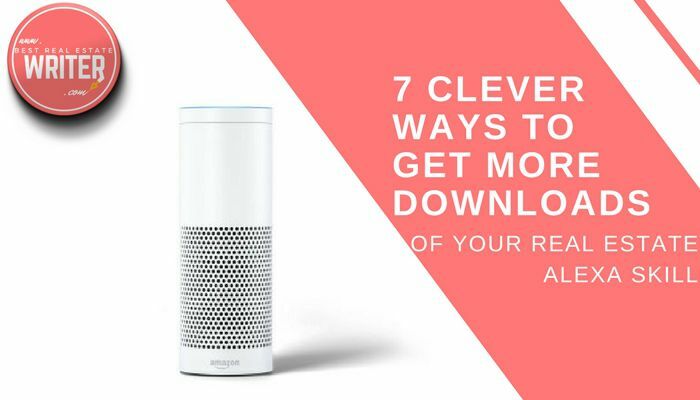 If you are interested in having me develop your Alexa Skill so you can start getting leads from voice searches, book a consultation with me.